Pass a URL to the next visitor! Submit to be redirected to the previous visitor's URL! For your weekly dose of the top 10 submitted URLs, simply fill in your email address and hit subscribe. Check-out the latest issue if you need more convincing. If at any point in time you wish to stop the newsletter from hitting your inbox, simply find the unsubscribe link provided in every email and click it. We value your privacy as much as you do, we will always keep your email address private and unsubscriptions will always be honored! Hey, y'all! Please support us by sharing UrlRoulette on your favourite social media sites. Thanks to generous, every day people like yourself throwing a little into our beer fund, we’re completely fan-funded. All donations go directly to support UrlRoulette! Thank you for keeping UrlRoulette free and available for everyone! Seriously, you rock. Ladies and gents, you’ve been asking and we are ready to deliver. 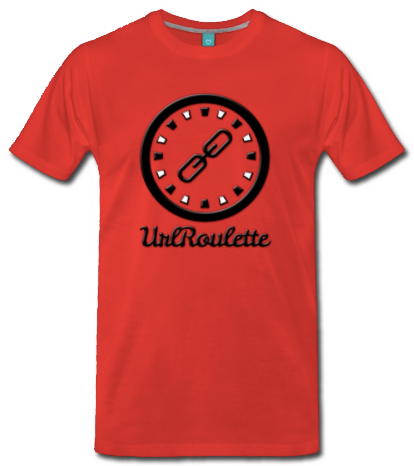 Check out the online store for the new UrlRoulette merch! We will be adding more as we go, so let us know what UrlRoulette gear you would like to wear, and we’ll see what we can get setup! © 2017-2019 m|mint, All Rights Reserved.